Bu çalışmada bitcoin kripto paranın bir yatırım aracı olarak borsalara alternatif olup olmadığı incelenmeye çalışılmıştır. Bu amaçla çalışmada bitcoin getirisi ve likiditesi ile borsaların getirisi ve likiditesi arasındaki ilişki incelenmiştir. Analizde 22.02.2012-15.08.2018 dönemine ait dokuz Uzakdoğu ülkesi ve Türkiye’nin borsa endekslerinin günlük getirileri ile Bitcoin günlük getiri verileri kullanılmıştır. Modelin sonuçlarına bakıldığında bitcoin getirisinin artış göstermesi Türkiye ve Uzakdoğu ülkelerinin getirilerini azaltmıştır. Buradan hareketle bitcoin kripto para biriminin örneklemdeki ülke borsalarının ikamesi olduğu görülmektedir. Bitcoin borsalara olan etkisinin en fazla olduğu ülkeler Türkiye ve Endonezya iken etkinin en az olduğu ülkeler Malezya, Singapur ve Kore olarak tespit edilmiştir. In this study, we investigated whether bitcoin crypto money is an alternative to the stock exchange as an investment tool. For this purpose, the relationship between bitcoin and the stock market was examined in terms of the returns and liquidity. In the analysis, daily returns of the 9 Far East countries and Turkey's stock markets and daily returns of the bitcoin were used for the period of 22.02.2012-15.08.2018. According to the results of the model, an increase of the Bitcoin's returns has reduced the return on the stock market in Turkey and Far East countries. From point of this, it can be seen that the as an investment tool, bitcoin cryptocurrency has been becoming the substitute for the country stock exchanges included in the sample. The highest impact of bitcoin on the stock exchange was observed in Turkey and Indonesia while the least effect was seen on the Malaysia, Singapore and Korea respectively. Amihud, Y. (2002). Illiquidity and Stock Returns: Cross-section and Time-Series Effects. Journal of Financial Markets, 5(1), 31-56.Atik M., Köse Y., Yılmaz B., Sağlam F., (2015). Kripto Para: Bitcoin ve Döviz Kurları Üzerine Etkileri, Bartın Üniversitesi İ.İ.B.F Dergisi, 6 (11), 247-261.Baltagi, B. H, Feng, Q. and C. Kao (2012). A Lagrange Multiplier test for Cross-sectional Depend-ence in a Fixed Effects Panel Data Model, Journal of the Econometrics, 170, 164–177.BIST (2018). Volatilite hesaplaması. http://www.borsaistanbul.com/veriler/verileralt/ volatilite-hesaplamasi, (Accessed in 14 Agust 2018).Breusch, T.S ve Pagan, A.R. (1980). The Lagrange Multiplier Test and Its Applications to Model Speciﬁcation Tests in Econometrics, Review of Economic Studies, 47, 239-53.Dumitrescu, E.I. ve Hurlin, C. (2012), Testing for Granger Non-Causality in Heterogeneous Panels, Economic Modelling, 29(4), 1450-1460.Eberhardt, M. ve Bond, S. (2009), Cross-section Dependence in Nonstationary Panel Models: A Novel Estimator, MPRA Paper, No. 17870.Engle, R. F. and C. W. J. Granger (1987). Co-integration and Error Correction: Representation, Es-timation and Testing. Econometrica, 55, 251–276.Granger, C. W. J. and Newbold, P. (1974). Spurious Regressions in Econometrics. 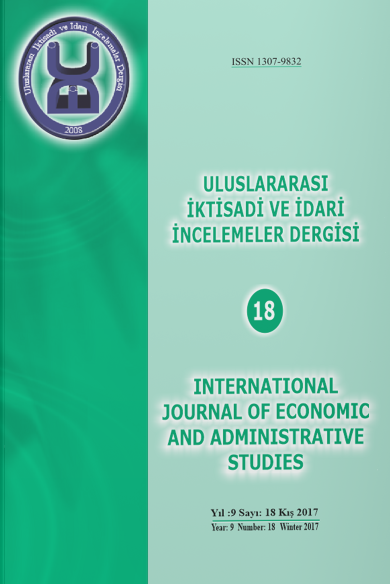 Journal of Econ-ometrics, 2, 111-120.Gümrah, Ü. ve Çobanoğlu, C. (2018). The Relationship between Liquidıty and Return in Turkish Stock Market, Ömer Halisdemir Üniversitesi İktisadi ve İdari Bilimler Fakültesi Dergisi, 11(2), 203-216.Hepkorucu A., Genç, S., (2017). Finansal Varlık Olarak Bitcoin’in İncelenmesi ve Birim Kök Yapısı Üzerine Bir Uygulama, Osmaniye Korkut Ata Üniversitesi İktisadi ve İdari Bilimler Fakültesi Dergisi, 1(2), 47-58.Hubrich, K., Lutkepohl, H. and Saikonen, P. (2001). A Review of Systems Cointegration Tests. Econ-ometric Reviews, 20(3), 247-318.Koçoğlu Ş., Çevik Y.E., Tanrıöven C., (2016). Bitcoin Piyasalarının Etkinliği Likiditesi ve Oynaklığı, Journal of Business Reserach Turk, 8(2), 77-97. Pesaran, M.H. (2004). General Diagnostic Tests for Cross Section Dependence in Panels, Cam-bridge Working Papers in Economics, 435.Pesaran, M. (2006). Estimation and Inference in Large Heterogeneous Panels with a Multifactor Error Structure. Econometrica, 74, 967–1012. Pesaran, M.Hashem and Yamagata, Takashi (2008). Testing Slope Homogeneity in Large Panels. Journal of Econometrics, 142(1), 50-93.Xi, H. and Weitian, L. (2013). Market Illiquidıty and Market Excess Return: Cross-Section and Time-Series Effects. http://www.diva-portal.org/smash/get/diva2:704213 /FULLTEXT01.pdf, (Accessed in 14 Ağust 2018).Westerlund, Joakim, (2008). Panel Cointegration Tests of the Fisher Effect. Journal of Applied Econometrics, 23, 193‐233.